Juicy, bright orange and strongly perfumed, our Fairtrade organic mango's moreish exotic tang peps up everything from puddings and smoothies to cured meat and shellfish. It’s best not to rely on colour to indicate the ripeness: many of the varieties we sell remain green despite being ready to eat. If the fruit is soft to the touch, tuck in. How to cut a mango? Slice in half lengthways, then cut down through the flesh of each half in a criss-cross pattern. Bend the skin backwards so the chunks spring up into a hedgehog shape. Slice these off and get eating. To help a mango ripen more quickly, pop it in a paper bag with a ripe banana. 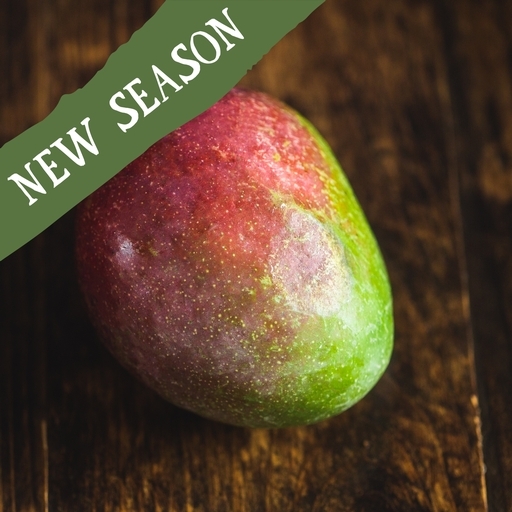 In many countries, unripe mango is eaten with salt or chilli. In the West, ripe mangoes are used to make chutney, whereas in Asia pickles are usually made with sour, unripe fruit. We usually source our mangoes from Spain during the European growing season. Out of season, we source from Fairtrade growers further afield including Morocco, Togo, Burkina Faso and Peru.